If you’re searching for a stand-out wedding location, we’ve got you covered. Walk down the aisle with the sand between your toes, dance to your first song among the vineyards and say ‘I do’ with the Mediterranean as your backdrop. Take your pick from beaches to medieval monasteries and countryside settings – there’s no end to the beauty. Imagine servings of tapas and jugs of sangria at your reception, celebrate your stag or hen in big-name cities such as Marbella and San Antonio and soak up the sizzling climate that Spain is renowned for. With that in mind, let’s check out the most iconic places in Spain for a wedding. Location: Situated in Deia, a small coastal village on the west of Majorca. The venue: Dating back to the 16th century, Son Marroig offers couples a mountaintop wedding. Nestled among perfectly manicured gardens, the traditional stone building and 500-year-old tower are the perfect base to recite your vows. Overlooking Forada below, this outdoor venue is ideal for sunset ceremonies – it’s also the best vantage point to view the north of the island. Choose to dine al fresco or in the manor house where its banquet culinary delights will leave you feeling like royalty. This venue also comes with an abundance of history from mystical pirate stories to antique furnishings and Greek relics. Hotel Mediterranean Bay: Based in the resort of El Arenal, you’re just a short drive from your venue and the city of Palma. This adult only establishment provides that much-needed tranquility before your big day. Unwind on Balinese-style beds overlooking the Mediterranean, before heading to the bubbling outdoor hot tub or lounging in your spacious suite. BH Mallorca: Keep the celebrations going at this 4 star hotel. Renowned for its pool parties, waterpark and events – there’s a never-ending list of live DJs. The facilities are first-class with a wide selection of a la carte restaurants and bustling bars. Location: Overlooking the bay of Sol d’en Serra, this protected area of natural beauty is set in Ibiza. 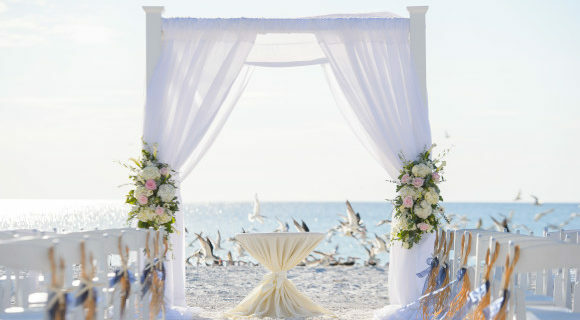 The venue: Amante’s mesmerising green forest and azure coastal scenery will captivate any bride and groom. Whether your nuptials are based on the pebbled sand spot below or up on the cliff top, this rural location sets the scene. Ibiza is known as the ‘White Isle’ for a reason, and this Blue Flag secluded stretch is one of them. When you’re not walking down an aisle made of soft grains, take advantage of Amante’s three levels – which can each boast a unique theme of your choice. Split into gold and platinum packages, your big day will include unlimited welcome drinks, canapes, food and an open bar for three hours as standard – cheers to that. Iberostar Santa Eulalia: Less than 10 minutes away from your venue, this All Inclusive paradise has a penthouse suite ideal for newlyweds. Leading out to an exclusive terrace equipped with a hot tub and rooftop views of Formentera, loved-up couples can enjoy VIP perks. Aguas de Ibiza Lifestyle & Spa: Again, this 5 star hotel places you in Santa Eulalia with breathtaking views of the marina. Along with an extensive list of restaurants and bars, there are hydrotherapy pools, hot waterbeds and a Roman sauna. Choose a suite on the fourth floor for high-end amenities, unlimited spa access and concierge service – allowing you to start your honeymoon early. Location: Perched among the hilltops of Marbella, this Costa del Sol countryside hotel will make your big day unforgettable. The venue: In the heart of a national retreat and nestled between the mountains of Sierra de Mijas Natural Park and the sapphire waters of the Mediterranean – it’s a nature lover’s paradise. This tranquil establishment feels worlds away from the hustle and bustle, but still only 20 minutes from Marbella’s lively promenade – so you’re in a winning location. A dedicated wedding coordinator is on hand to help with your every need from chair ribbon colours to flower centerpieces. 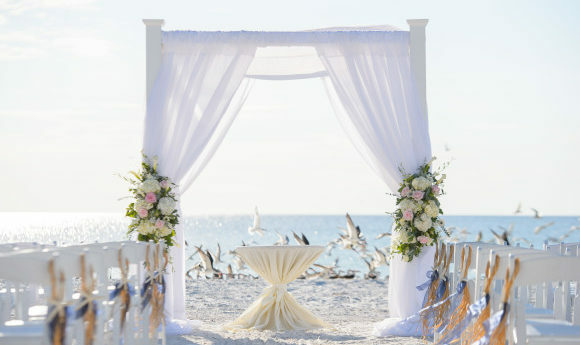 Walk down the white carpet, say your vows under a flower-filled arch and have your very own cava stand. The bride and groom can also enjoy a complimentary stay in one of the hotel’s lavish suites, while guests have exclusive access to the spa. La Cala Resort: For ease stay at your venue, the La Cala Resort is home to an exceptional golf course and award-winning spa. The rooms are chic with mesmerising balcony views and top-of-the-range facilities. There are three restaurants and two bars serving a selection of gourmet treats. Puente Romano Beach Resort: Conveniently located in the heart of Marbella, you’ve got easy access to your wedding venue. Alongside its winning location, this stylish 5 star offers afternoon tea on the terrace, long sunbathing hours by the pool and a huge golf course for sport enthusiasts. Live the high life in one of their Grand Suites where you’ll have the benefit of your own private terrace and spacious living room. Location: Cap Rocat and its castle-like relics lie in the heart of Majorca’s bustling capital, Palma. The venue: This enchanting spot invites loved-up partners to immerse themselves among fortress remains, Mediterranean views and 17th century charms. Once a hospital, prison office, battery of salutes and now home to many cultural events and some of the island’s most lavish weddings – Cap Rocat comes with the perfect mix of heritage and elegance. The main service will take place in a nearby church or on the castle grounds, roof or terrace. Mediterranean cuisine will be served in the central courtyard under the stars, where groomsmen will toast to your special day and you’ll cut the cake before taking to the dancefloor. What are you waiting for? This fairytale location is calling your name. Cap Rocat: Who said the royal ceremony has to end? Extend your big day by staying in the fortress itself. There are 30 grand rooms and the pool boasts an infinity edge. More than just a bed and bathroom, these suites are super spacious with living areas and hammocks for added luxury. Flamboyan Caribe Hotel: Just outside the city of Palma in Magaluf, this deluxe hotel overlooks an idyllic powder white beach. Relax by the pool and revel in your 4 star amenities or release those pre-wedding tensions in the spa. The restaurants are a la carte and serve a wide variety of mouth-watering dishes, while the bars have Pina Coladas and Tequila Sunrises on the menu. Location: Based in southwest Spain, amidst Cadiz and Seville. The venue: Flaunting awards from Conde Nast for its stylish interiors and a wealth of raving reviews from ELLE magazine, The Telegraph and Times – it’s safe to say your Casa La Siesta wedding will be picture-perfect. Your ceremony will be held front of house under vivid flora-filled arches and among a grassy rose garden, or you can opt for a sandy alternative at El Palmar Beach which will be beautifully decorated to your required specifications. Locally sourced food will be paired with wine directly from the vineyards for your main meal. There’s also the option to add a Champagne breakfast, groom’s brunch, post-party barbecue and reception canapes to your package. Take your pick from live bands, silent discos, circus performances and DJs as your entertainment – the possibilities here are endless. Silken Al Andalus Palace Hotel: Enjoy the best of both worlds with this beach and city stay. Nestled among orange blossoms and the gardens of Heliopolis, this picturesque hotel will have you and your guests in awe. There are 623 swanky rooms, a piano bar, large pool and a 15,000 m2 garden. Hotel San Pablo: Based in Seville, you’re just moments from your venue and other city highlights. Its classical design will ensure your stay is nothing short of stylish with its marble flooring and beautifully decorated rooms. Free Wi-Fi, 24-hour service and late checkout are just some of the added benefits. Location: Just 10 minutes from Las Palmas in Gran Canaria, hideaway in the exotic countryside of Arucas for an urban ceremony. The venue: Once a royal manor palace, now the grounds of a botanical masterpiece – the El Jardin de la Marquesa is a tropical delight. Built in 1880 say ‘I do’ among 500 different types of flora and fauna from all over the world, there’s even free-roaming peacocks. The elegant glass marquee is where you and your guests will dine under twinkling fairy lights and the vintage wooden beam garage will be on hand for pre-wedding cocktails. There are also two lakes if you’d prefer your nuptials around shimmering waters or outdoor entertainment. Your location offers endless photo opportunities, and did we mention you can rent the venue until 5am? The celebrations can last all night long. Hotel Cristina Las Palmas: Find 306 rooms over 11 sweeping floors, a piano bar, nightclub, a la carte restaurants and a rooftop pool. Based on the Blue Flag beach Las Canteras, take advantage of Gran Canaria’s eternal sunshine. Executive rooms feature sea views and there’s a wealth of family and double suites too. Hotel Reina Isabel: With the beach on your doorstep and Las Palmas bustling promenade within easy reach – what more could you want? This 4 star complex is home to a state-of-the-art floatation pool, massage beds and salt cabins for couples seeking serenity. Location: Perched at the most northerly point of Majorca, in the resort of Playa de Formentor, this 5 star establishment is the ideal spot for beach nuptials. The venue: With previous guests including Grace Kelly, Audrey Hepburn and Charlie Chaplin, this luxury establishment is also known as ‘Hotel of the Stars’. Surrounded by pine forests and dominating mountains, the backdrop alone will have you falling head-over-heels. Its flawless private beach sits on the bay of Pollensa where turquoise-tinted waters set the scene for a magical Spanish wedding. More than just a stretch of sand, this lavish venue invites you to take photos in its romantic garden, dance under the moonlight from the terrace and indulge in its taste bud tantalising cuisine. Formentor Royal Hideaway Hotel: There’s nothing more convenient than staying on your wedding grounds. This 1929 hotel is impressive, from its collection of celebrity guests to its 5 star ratings and spectacular views of Formentor Cape Bay. There’s 1,200 acres of forest and the sapphire waters of the Mediterranean are at your fingertips. And when it comes to being pampered, this hotel has its own beauty salon and spa. Portblue Club Pollentia Resort & Spa: As another highly-rated hotel near Formentor, this 4 star beauty was built in 1986. Don’t be fooled by its age, the hotel’s interiors are ultra-modern with contemporary suites, a well-equipped fitness centre and four delectable restaurants. These off-the-beaten path venues are among some of the most iconic places in Spain. Whether you’re after city vistas near Cadiz, toe-sinking celebrations in Majorca or rural settings in Gran Canaria – we’ve provided you whttps://www.broadwaytravel.com/spainith the very best. What is Portugal Famous For?